The NIKEN introduces a new riding revolution that is born of pure innovation and performance. The NIKEN™ LMW chassis is an exclusive motorcycle control system that provides unparalleled rider confidence across a wide range of road conditions. With two front tires leaning in unison, the NIKEN doubles the amount of available grip for exceptional stopping power, cornering confidence, rider comfort and impeccable road manners—all while maintaining natural steering feel. NIKEN doesn’t look like anything on the road because it isn’t like anything else on the road. Graceful curves highlight the mass-forward design to show off the unique LMW system, combining futuristic technology with flowing, organic style. Derived from the award-winning MT-09™, the advanced CP3® inline 3-cylinder motor uses Yamaha’s full range of performance technology to produce exceptional torque with linear power delivery. This results in a flexible, responsive powerplant that combines the best aspects of both 2- and 4-cylinder motors while remaining light, slim and compact. NIKEN features a complete range of technologies to boost rider confidence and performance, including Yamaha’s ride-by-wire throttle system, adjustable throttle mapping, traction control and ABS. Riders also enjoy the convenience of a factory quick shifter and integrated cruise control. Yamaha has always been committed to creating innovative and exciting designs that offer riders the best choice for their needs. Whether riding solo for the commute to work or spending weeks crossing the continent with a passenger and luggage, Yamaha’s Sport Touring motorcycles provide a world of opportunity to make memories that will last a lifetime. Combining outstanding sport performance, all-around versatility and serious long-distance ability, Yamaha’s Sport Touring lineup is designed to appeal to a wide range of riders who are looking to enjoy the many new experiences, places, and people that they will discover when traveling the Roads of Life. 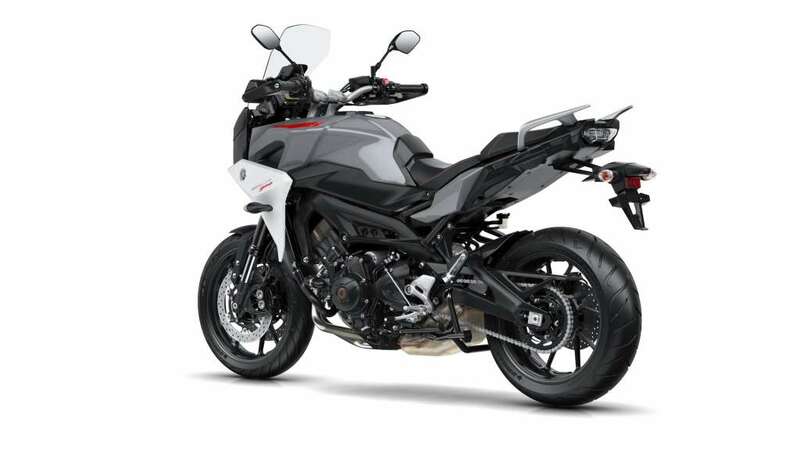 Derived from the award-winning MT-09, the NIKEN features a thrilling 847cc liquid-cooled inline 3-cylinder motor packing a range of advanced technologies. With DOHC heads, an oversquare 78mm x 59.1mm bore and stroke and 11.5:1 compression ratio, NIKEN delivers an exciting, torquey character, refined with additional crankshaft inertia for smooth starts. By utilizing the naturally smooth firing order and power characteristics of the 3-cylinder motor, Yamaha’s CP3 engine produces extremely linear torque with an excellent feeling of connection between the throttle grip and engine. To boost refinement and improve rider and passenger comfort, the motor features a geared counterbalancer to minimize engine vibration. This results in a responsive powerplant that combines the best aspects of both 2- and 4-cylinder motors while still light, slim and compact. The CP3 engine uses forged ‘fracture-split’ connecting rods, where the big-end ring of a connecting rod is split in two to create a more precise mating surface when they are bolted together again around the crankshaft. The cylinder block is offset towards the front wheel, to reduce piston force against the cylinder walls, improving efficiency. And the cylinder bores are plated with a ceramic composite for excellent durability and heat transfer. To provide a broad spread of torque and a unique intake sound, the airbox intake funnels have been designed with three uneven lengths. This combines with the fuel injection system and cylinder head design to deliver a torquey, flexible engine character. 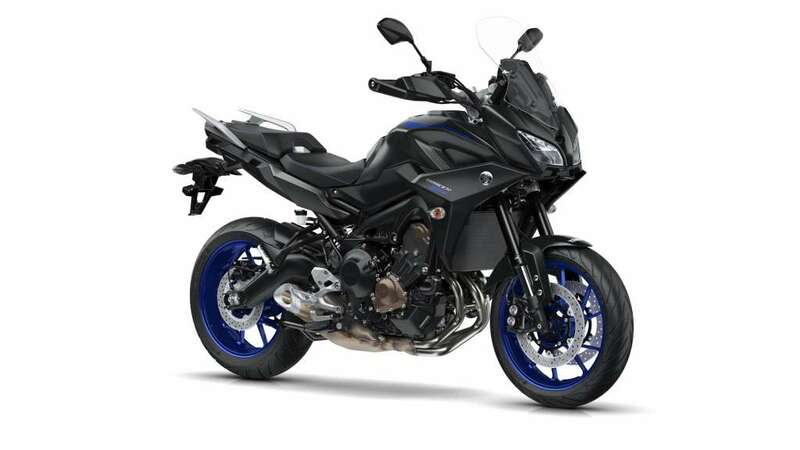 Yamaha’s assist and slipper clutch gives the rider smoother, more confident downshifts when entering corners aggressively, as well as a lighter pull effort at the lever in day-to-day riding, all while easily handling the torque of the NIKEN’s high-output motor. The transmission harnesses the low-to-mid-range torque and excellent response characteristics of the inline 3-cylinder engine to give riders ideal gearing ratios for any type of riding. The 6-speed transmission also features staggered input and output shafts in a triangular layout, to reduce overall engine size and further centralize mass. The NIKEN utilizes a compact three-into-one exhaust system with midship muffler. Not only does this layout centralize mass for sharper handling, the headers feature SixONy™, a hard-wearing ceramic nano-film coating that looks great while resisting both exhaust heat and the elements. Featuring a short, slash-cut exhaust outlet, the NIKEN howls with a sweet 3-cylinder exhaust note, too. The ride-by-wire Yamaha Chip Controlled Throttle (YCC-T) system senses the slightest throttle input by the rider, relays the data to the ECU, which instantaneously calculates the ideal throttle valve opening based on engine rpm and throttle opening, and then sends commands to a servo-motor actuator that moves the throttle valve which actively controls the intake airflow volume. This technology contributes to the rider’s feeling of torque and controllability from the 3-cylinder engine. 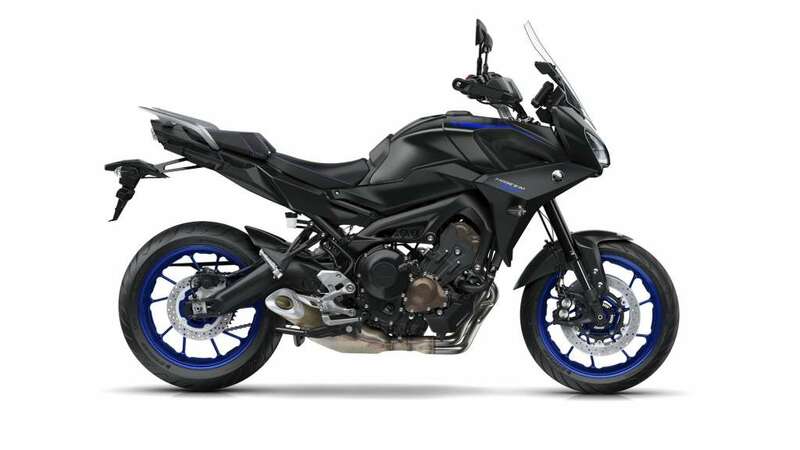 The NIKEN features Yamaha’s D-Mode system to allow the rider to choose the optimum engine character for their riding situation and preferences. The rider can choose from three throttle valve control maps (Standard Mode, “A” Mode, and “B” Mode) for different throttle response characteristics at the push of a button. A Traction Control System (TCS) assists the rider in managing traction on various road conditions by quickly modulating throttle opening, ignition timing and fuel volume. The NIKEN TCS includes two modes to suit various road conditions, and can also be disabled by the rider if they so choose. The NIKEN includes a cruise control system powered by the YCC-T. Using the left handlebar switchgear, the rider can easily select or adjust a set speed to ease long-distance touring on the highway, improving rider comfort. 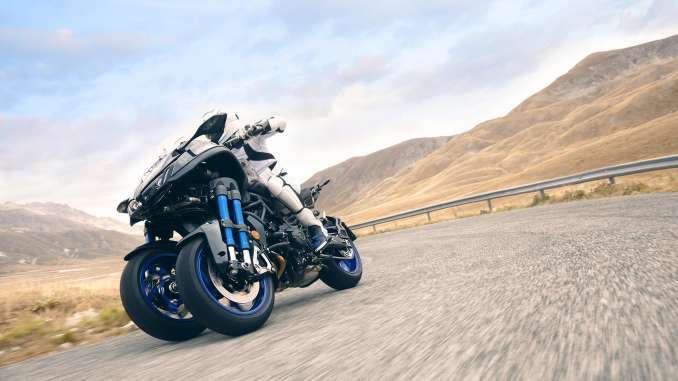 NIKEN comes standard with Yamaha’s Quick Shift System (QSS), which allows on-throttle upshifting without the clutch, for smooth, fast shifts with minimal loss of drive. A high contrast all-LCD display provides a clear display of engine and road speed, electronic systems such as traction control and D-Mode, fuel range, economy and more. Yamaha’s advanced LMW (Leaning Multi-Wheel) chassis is the result of countless hours of engineering and testing to create a unique motorcycle control system that provides unparalleled rider confidence no matter what the road conditions. With two front tires leaning in unison, the NIKEN doubles the amount of available grip for exceptional stopping power, cornering confidence and rider comfort, especially over uneven pavement and poor road conditions. The radical front end of the NIKEN uses paired fork tubes for each front wheel and steering linkages to provide ideal steering geometry and natural steering feel. The system turns and leans like a conventional motorcycle, but with twice the front tire grip. And, like other Yamaha sportbikes, this system provides adjustable compression and rebound damping for a highly tunable ride. Front wheel track is only 16.1 inches, making NIKEN no wider than traditional motorcycles and ideal for congested, urban riding conditions, with maximum lean angle at an impressive 45 degrees. With a rider aboard, NIKEN offers a perfect 50/50 weight distribution for neutral handling. And the seat design, fuel tank width, and other dimensions are all set to work with the qualities of the compact 3-cylinder engine to achieve a sporty handling character, an upright riding position and a narrow body at the seat/tank junction. Connecting the LMW system to the rear wheel is an all-new hybrid frame that utilizes steel castings and tubes with a lightweight aluminum swingarm pivot area and swingarm. Balanced for rigidity and steering response, the NIKEN chassis provides superb handling and natural steering feel. The rear suspension features a linkage-type Monocross® shock, mounted below the seat with an almost horizontal alignment. This unique positioning contributes to mass centralization and a slimmer body design. The rear suspension is also fully adjustable for spring preload as well as compression and rebound damping. NIKEN uses paired 15-inch lightweight alloy wheels with LMW-specific 120/70R15 tires. Developed in concert with the chassis, these tires feature sportbike-style profiles and construction, for high levels of grip, wear resistance and wet-road capability. Out back, the rear wheel mounts a massive 190/55R17 rear tire for a combination of style and traction. Mounted outside of each front wheel are disc brakes with four-piston radial calipers, matched to a large rear disc brake, complete with Yamaha’s responsive ABS. With paired front tires and the security of ABS, NIKEN riders are able to brake with confidence across a hugh range of road conditions. Highlighting the unique LMW system and all-new riding experience, the NIKEN presents a muscular and aggressive appearance unlike anything else on the road today. The front suspension systems are proudly displayed, while the body curves to a graceful and sleek tail section. Dual LED headlights present a furious glare at the road ahead, but match style with function, providing a huge spread of crisp illumination for excellent visibility. Position lighting, mirror-mounted turn signals and brake lights likewise use LED technology, for bright, long-lasting performance and modern style. The NIKEN fuel tank is gracefully curved to provide a narrow midsection, and uses the same lightweight alloy found in the YZF-R1® and R6® fuel tanks for reduced weight. Paint and surface finishes are selected to highlight the technical nature of the LMW chassis as well as for long-lasting durability. With upright ergonomics and a slightly forward lean, the NIKEN rider is ready to attack corners or cruise down the highway with equal comfort. The tapered aluminum handlebar, placement of the seat and footpegs, and narrow midsection create excellent rider feel. A wide, plush saddle boosts both rider and passenger comfort, too.